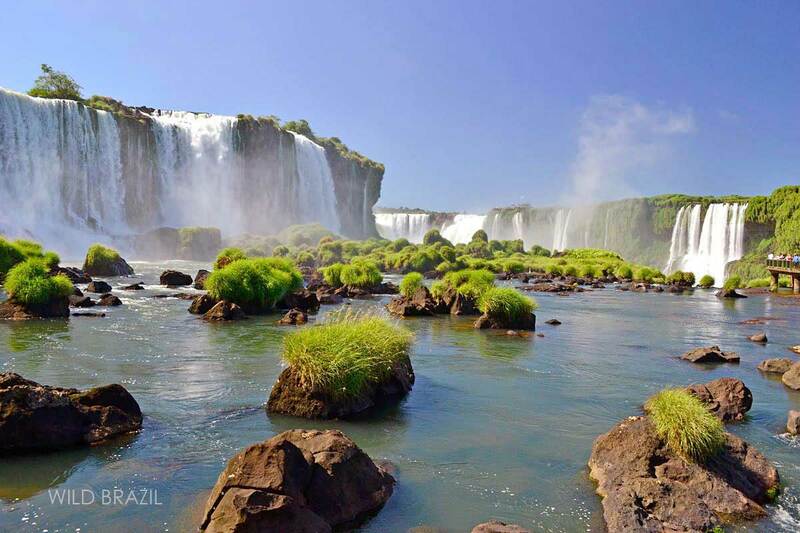 The Iguaçu National Park in Brazil and the Iguazú National Park in Argentina, both inscribed on the World Heritage List, constitute one of the most significant remnants of the Interior Atlantic Forest. 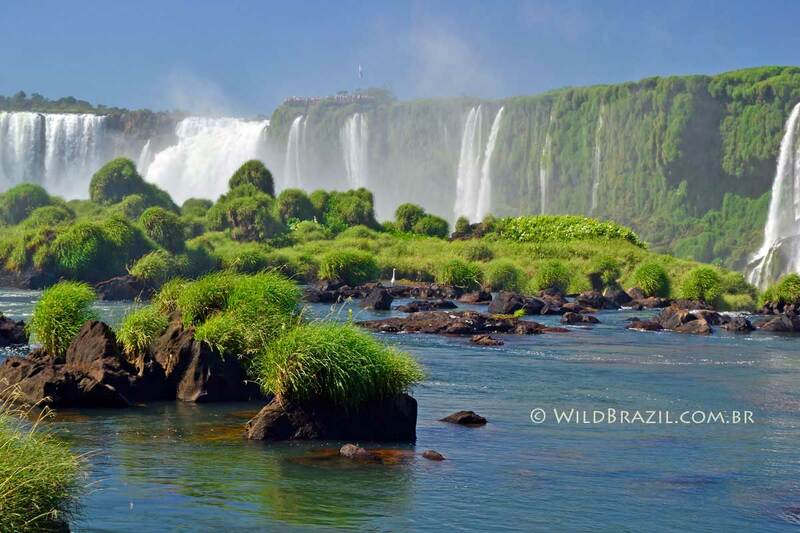 The waterfall is almost three kilometres wide and consists of 150 / 300 separate falls (depending on the water level) dividing the Iguazu River in two levels and creating an amazing spectacle of the Nature! 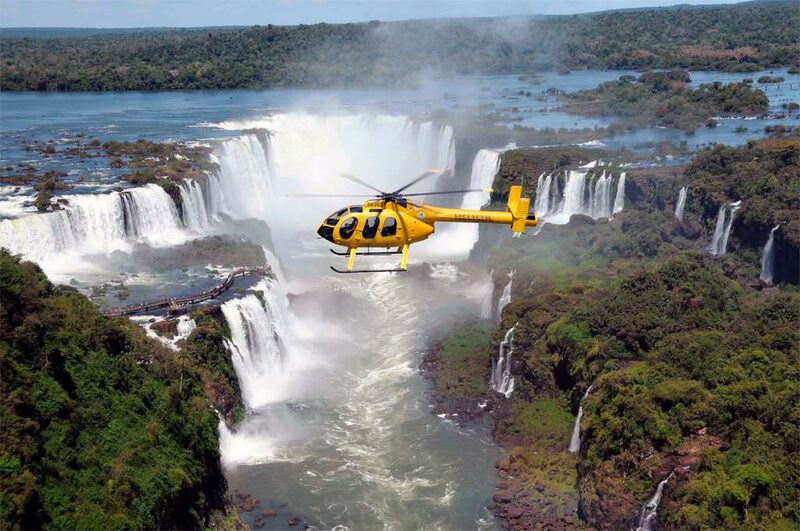 For most of its course, the Iguazu River flows through Brazil, however, most of the falls are on the Argentine side. The permanent spray from the cataracts forms impressive clouds that soak the forested islands and river banks resulting in a visually stunning and constantly changing interface between land and water. An often-photographed rainbow usually appears stretched across the falls in a particular spot. The rich biodiversity includes over 2,000 species of plants, 400 species of birds and possibly as many as 80 mammals, as well as countless invertebrate species. Arrival at Foz do Iguaçú Airport (IGU). Meet the guide, transfer to the choosen hotel. After breakfast transfer to Iguazu Visitors Centre. Entry in the Brazilian Iguaçu National Park, where you'll walk along a trail observing the magnificent waterfalls. 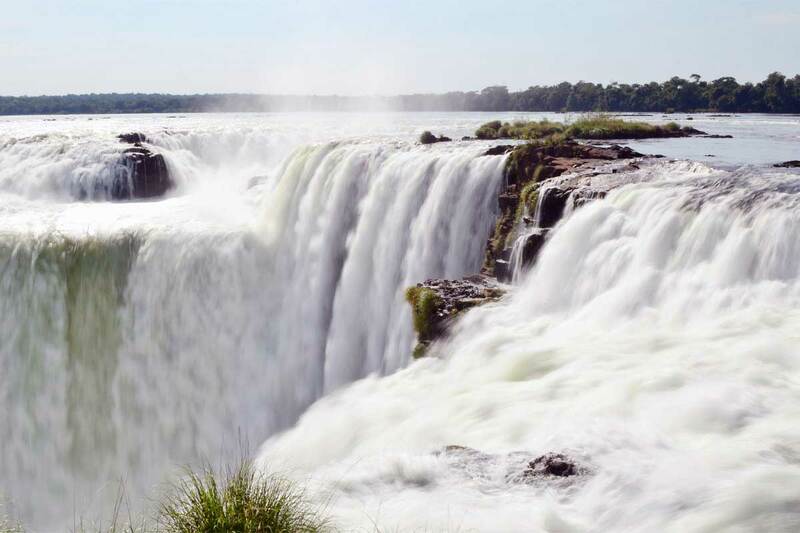 At the end of the trail you will see the famous "Devil's Throat" to the opposite side of the falls, in Argentinean territory. The duration of the excursion is about 4 hours. An optional excursion at the falls is the Macuco Safari, a two hours tour that begins through an exuberant forest on electrical vehicles, to learn about flora and fauna. 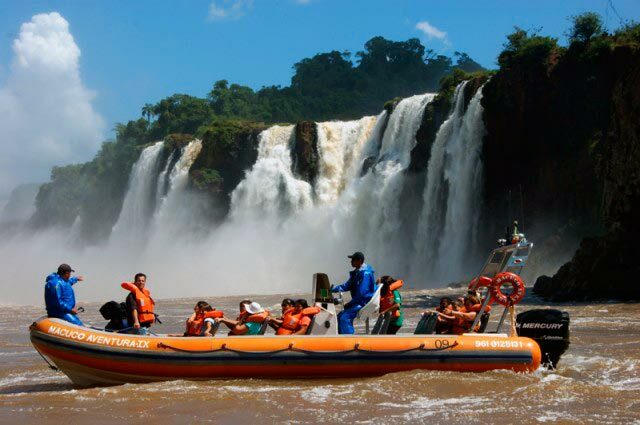 Once arrived at the port on the Iguazu river you will wear life jackets and on a speedboat you will upstream the river toward the Devil´s Throat: an intense a breathtaking adventure! After lunch you can visit the Bird Park or do a tour by helicopter (optional tours). Return to your hotel. Dinner and overnight. 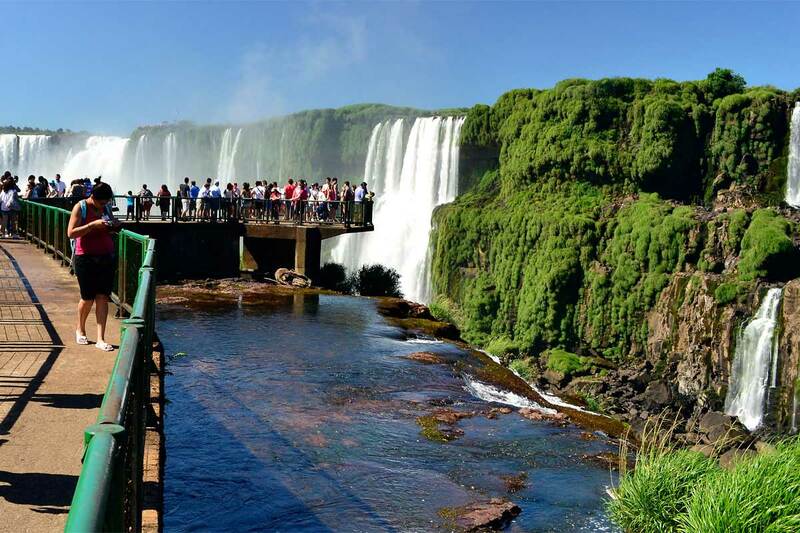 After breakfast transfer to the Argentine Iguazú National Park (passport need), visit to the wonderful waterfalls, upper and lower circuits and Devil´s Throat. The duration of the excursion is about 8 hours. An optional excursion is the Great Adventure and boat trip. Departing from the Operative Center you will enter the jungle by a special truck where your guide will introduce the place's natural and cultural resources. Once arrived at the dock, visitors shall board on the boats and sailing in the Lower Iguazu River for 6 kms towards the waterfalls area, enjoying plentiful rapids. Return to your hotel in the Brazilian side. Dinner and overnight. Transfer to the airport according to your departure flight. According to your scheduled flights, the tour may be reduced to 3 Days / 2 Nights. Seeing the falls in near solitude is magical, but we offer more than just a great location. Step through our doors into a world of understated luxury. Soak up the jungle chorus while you float in the pool, stroll gardens bejewelled with orchids and sip caipirinhas as the sun goes down. Embark on the ultimate adventure at South America's first and only Forbes Five Star hotel, and you'll never want to leave. 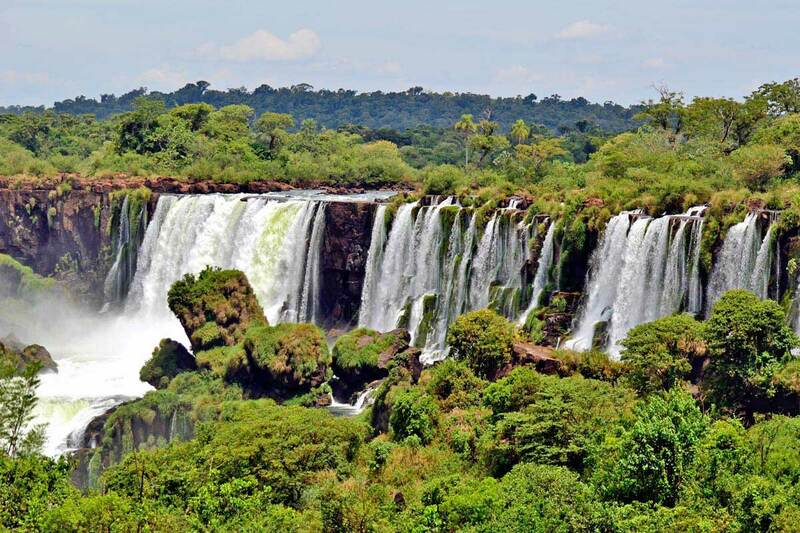 Just 20 minutes from the famous Iguazu Falls and 6 km from the airport, right on the border between Brazil, Paraguay and Argentina, the luxurious Wish Foz is located. Its exquisite infrastructure for families and couples and the advanced level of services, aimed at guests more demanding, qualify as an excellent choice in hosting, being chosen as the "The Best Resort in Brazil". 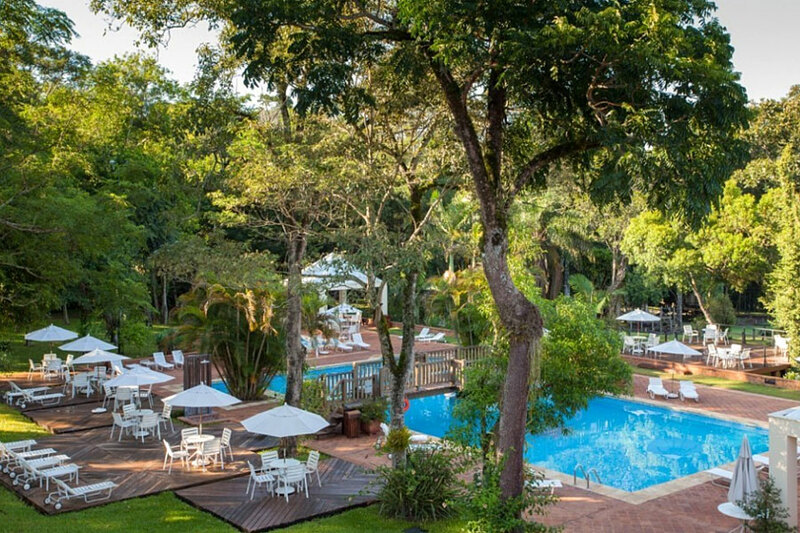 Located at 400 meters (1.300 feet) from the entrance of Iguazu National Park and next to the Bird Park, San Martin Resort & Spa offers 4 star accommodation among nature near Iguazu Falls Brazil. 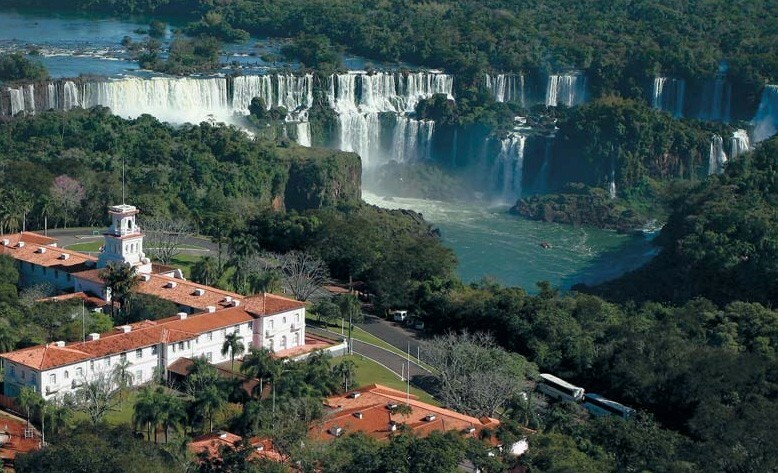 The hotel is 1 mile from Foz do Iguaçu International Airport. The resort offers a relaxing Spa, where our guests can hire massage and bath services. 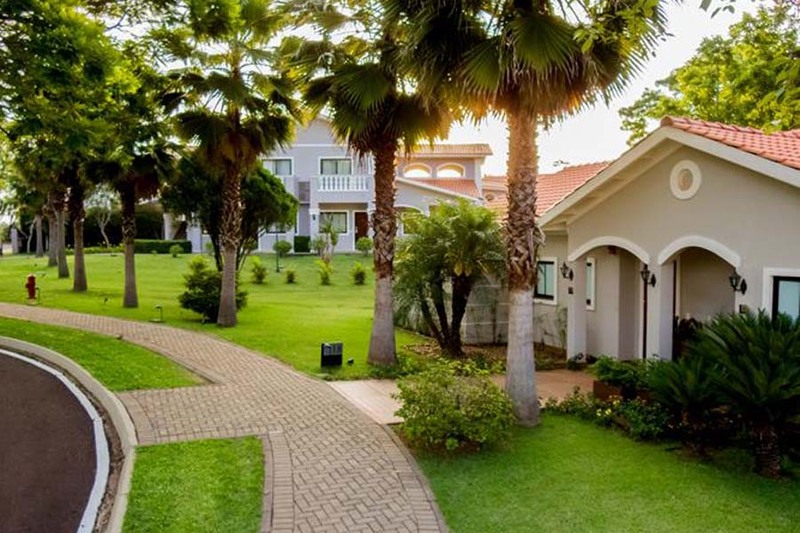 There are many cozy amenities at San Martin Resort & Spa, like a swimming pool surrounded by gardens, trails through native forest and several sports facilities such as gym, volleyball courts, soccer and tennis. The Continental Breakfast is included and is served from 6:30 AM to 10:30 AM. Tarobá Restaurant offers a range of international specialties until late. 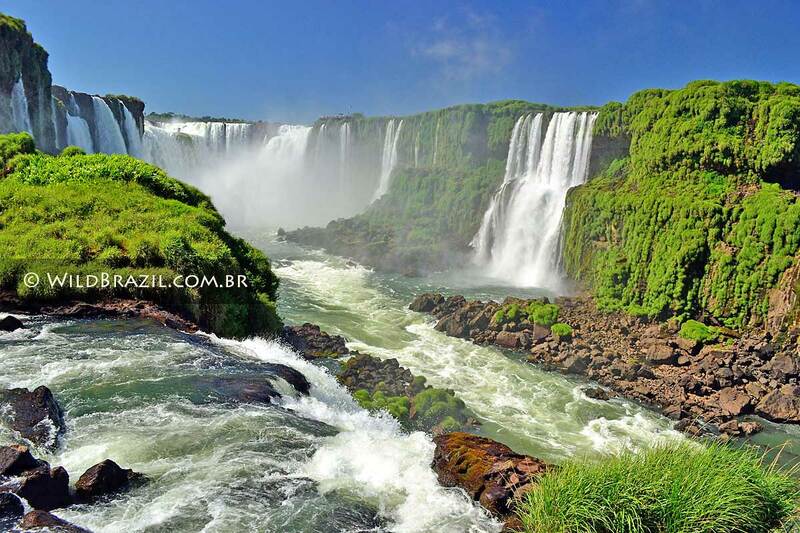 Located on the Cataratas Highway close to the main tourist attractions of the city such as the Iguazu National Park. It is also seven kilometers from the border with Argentina and four kilometers from the International Airport of Foz do Iguazu. 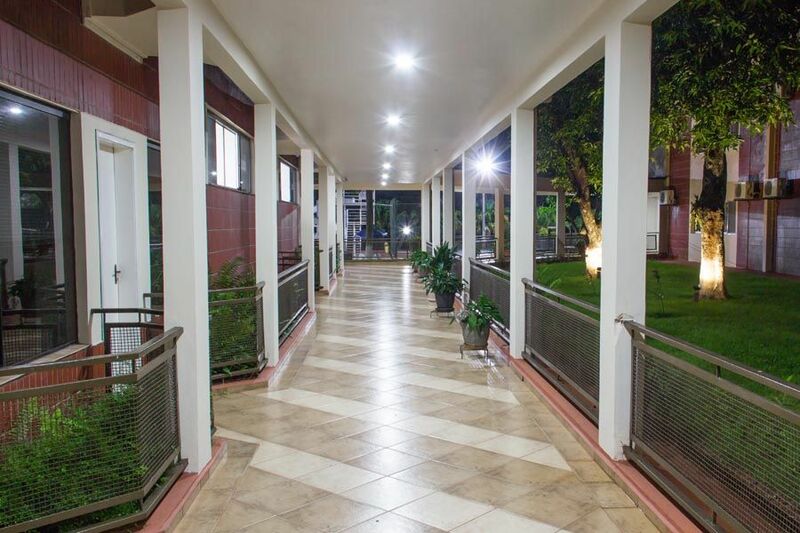 The accommodations, divided into two floors, can accommodate from one to four people and feature air-conditioner. There is the option of rooms with tiled or anti-allergic floors, and rooms adapted for people with special needs. The suites are more spacious and have a living room. Surrounded by lots of vegetation, the leisure area of the development has adult and children's pools, with a toboggan. The restaurant has à la carte menu or buffet system, with the best of Brazilian cuisine and a wine list.